If you want to know how to get Facebook page likes, you’re in for a treat. In this guide I’m sharing all the best ways to get Facebook page likes—hacks that work and quickly. Many people will tell you that to get a lot of Facebook Page Likes you need high quality content. There are hundreds of thousands of blogs that put out the highest quality content but get next to no page likes. And then there are all those pages that have millions of likes even though the only thing they do is steal content from Reddit. If you want to know how to get Facebook page likes fast, forget about making quality content. Even if you’re writing Facebook business posts, don’t think “high quality”. Quality content will not get millions of page likes anytime soon. I’ve seen this from firsthand experience. For instance, take a look at Facebook pages to do with the gaming industry. In the gaming industry there are numerous bloggers who put out unintelligent content but get thousands of page likes on Facebook. And similarly there are blogs that put out stellar content and struggle to get any Facebook page likes whatsoever. GamesTM is a long running gaming magazine that is considered by many to be one of the best in the business. It puts out the finest games articles. Its Facebook page is five years old. Guess how many likes this Facebook page has? The answer is just over 3 thousand. Meanwhile The Gaming Lemon has been going for five years too. The Gaming Lemon puts out entertaining and humorous games videos. It (he) has 509,000 likes. Now that is getting Facebook page likes fast. What hacks did The Gaming Lemon use? Why would a reputable mass market magazine have so few shares compared to a humorous Youtube channel? The reason is because social media and “high quality content” are not related. I wish they were. But they are not. Being social has nothing to do with putting out the best content. It has everything to do with… well… being social. Top quality content does not equal likes. So what does equal likes? 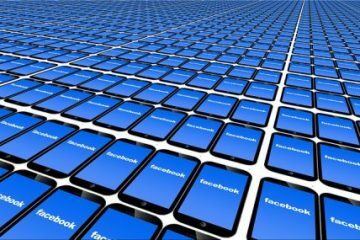 Let’s take a look at Facebook page like hacks that will help you to get millions of Facebook page likes for free and fast. The basic and crucial point: The most basic and crucial aspect of getting likes for your Facebook page is a four stage process. 2) Understand them and what they want. 4) Put something that your audience wants alongside your Page URL in that place where your audience is already hanging out. Everything else in this list is a way of achieving the above four stage process. 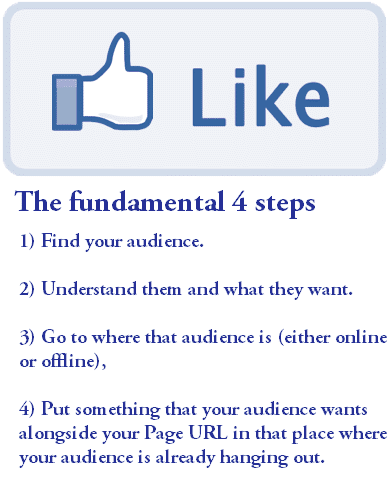 But that four stage process is ultimately the one and only way to get more Facebook page likes. Now let’s take a look at the top 100 ways to gain Facebook page likes. Personality is the absolute most important thing in social media. It’s because of personality that a single man Youtube show can get more page likes than a commercial newspaper. 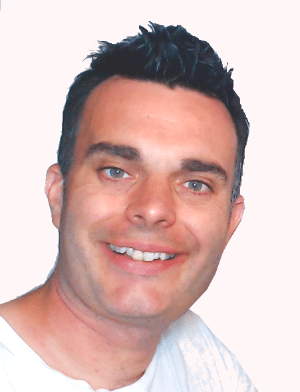 If you want to truly take off online you are going to need personality that shines. PewDiePie. Jenna Marbles. Dude Perfect. Lad Bible. Elite Daily. They all have oodles of personality. And you need the same. To get more Facebook page likes, show more personality. The problem is that most people fail to choose a personality to show. We just want to be the “best”. To get more Facebook pages likes, choose a personality and stick to it. People want to get to know your page as though it were its own person. And to get to know your page you have to have personality. I’ll be creating a guide to personality later on (like me on Facebook for the update). But for now let me just say that one thing: a positive personality sells and it sells a lot more than “top quality content”. One of the fastest ways to get Facebook page likes is to use your already established social network: your friends and colleagues. One way to do this is to invite contacts from your email list. Some of your friends will be on your email contacts list but I’m willing to bet you’ve got a lot of friends you’ve never actually emailed. That’s why you need to use Facebook’s own Invite Friends button. Go to your Page and click Community in the left column. In the right column, click Invite your friends to like [your Page’s name]. Enter a friend’s name in the search box and then click Invite next to their name. Note that some people will be irritated by this. You might like to choose only those friends who you genuinely think will enjoy your page. You know who doesn’t like free stuff? No one, that’s who. This is a great hack for Facebook page likes. You can gain thousands of new Facebook followers this way. The idea is to give your fans something for free in exchange for performing the desired action. This pleases your fans, increases Facebook engagement rate (helping you to improve Edgerank) and promotes your page. You give away free stuff, you receive free LIKEs. It’s a win/win. 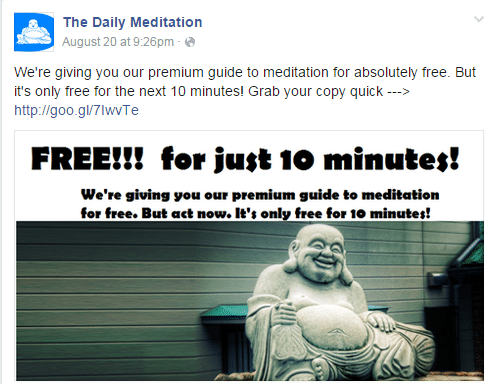 Of course your post will receive more engagements if you give away an awesome freebie. NOTE: make sure that your audience actually understands how to tag people into their images. Some people will just send you pictures in private message, which of course is no good. So be explicitly clear when you give out the instructions. The best way to get your first 1000 Facebook page likes is to invite friends. Well, your friends want you to succeed (at least your true friends do.). Your friends also like to know what you’re up to. Because of that they’ll likely visit your Facebook wall fairly often. That’s why you need to mention your Facebook page on your own personal profile. More specifically in the jobs section. It’s conveniently right at the top where everyone will see it. Stick your Facebook Page URL in there and watch as your friends gradually start liking your page. Use this strategy to get your first 1000 Facebook page likes. How long as your Facebook page been going? Maybe it’s new, in which case you might as well skip this step for now. But if it’s six months or older you might want to take a look at your Facebook Insights tab. So visit Your Page > Insights. And use the data to find strategies to get more Facebook page likes. You want to use this information to gradually make your posts more and more effective. Your Facebook page insight is your key to finding the best types of posts to get more Facebook page likes. One way to get more Facebook page likes quickly is to do cross-promotion (a great idea for social media in genera. Here’s a guidel). Do you have two pages that are somewhat related? If so be sure to cross-promote those pages. Fans of one of those pages will probably like the other page too, especially if you introduce them as a pair. That way you can get two Facebook page likes from one person. Kill two birds with one stone. When it comes to knowing how to get more Facebook page likes, you have to understand your audience. The more you understand your audience the better equipped you’ll be to please them. It can be easy to see Facebook likes as nothing more than a number. But in truth, a Facebook like is an actual person who enjoys your page. That’s obvious but it’s amazing how quickly we can start thinking about our page likes as nothing more than a number. Who is that person who enjoys your page? What do they care about? What do they want and need? What other subjects and products do they enjoy? What countries do they come from? What cities? 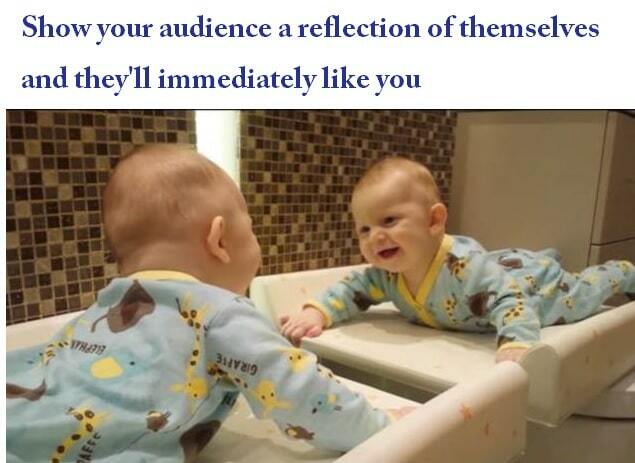 You should know your audience like the back of your hand. The more you understand them the more you will understand how to get Facebook page likes. 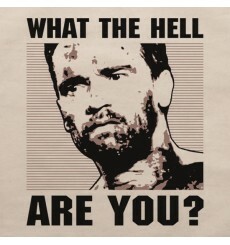 Ask the famous Predtor line “What the hell are you”. Or in other words, conduct market analysis to understand your demographic and their preferences. Wan to know the best strategy for Facebook page likes? Tell people to like your page. A lot of people don’t like doing this. We don’t like being too forceful and demanding. But a lot of times success comes down to your ability to straight-up demand success. So you can either tell people to like your page or you can watch as they pass you by. The best way to get more Facebook page likes is to tell people to like your Facebook page. It’s so simple it’s beautiful. Put call to actions everywhere. Put them on your site, on your cover photo, on your business cards, even on a custom-made t-shirt. Put your Facebook Page title out there and next to it put the words “Like my page”. Sometimes the direct approach is the best one. You know about the page plugin and you don’t really need me to tell you anything more about it. When you tag someone in your status update the update appears on their wall. Unfortunately a lot of people have disabled tagging (due to spamming) but some of your fans may still allow tagging. But some people still allow Facebook’s tagging system to publish content to their timelines. So why not take advantage? One of the best ways to use Facebook tagging is to thank people for liking your page. To see the people who have liked your page, visit: Your page> Settings >Banned Users > click on the BANNED button > Pages who like this. From there you can see which other pages have liked you. You can then tag them in your posts. Use the Banned section to find your audience, then tag them. Posting amazing content is definitely one of the most important things you can do to earn Facebook page likes. But just what exactly is amazing content? Amazing content is content that creates engagements. A high engagement rate is essential for a good Edgerank score. If you’d like to increase your Facebook page likes you should take a look at my comprehensive list of 61 ways to increase Facebook engagement rate. 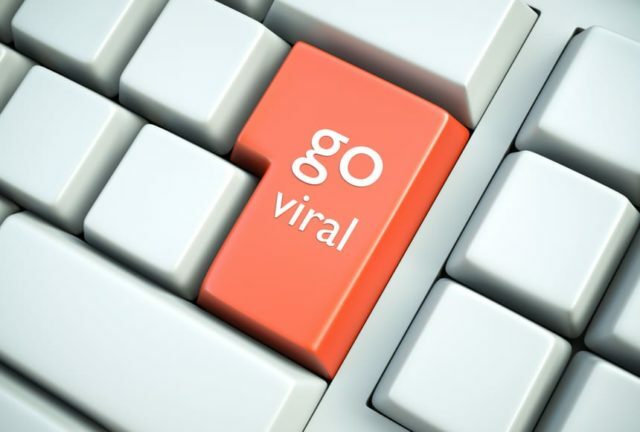 Don’t be afraid to hit up viral pages to see what’s trending and to get viral content. But try to make it viral content that related to your page, otherwise your audience will come to view you as another of the many spammy viral pages. Simple. You have fans on Twitter and you have fans on Facebook. Merge them. Simply share your Twitter profile on Facebook and share your Facebook profile on Twitter. To get more Facebook followers, involve people more. When your fans tag your page in their photos their friends get to see your page. Naturally that’s going to lead to some good exposure. The difficulty of this step depends on the nature of your business. If you’re running an event you can ask the people who attend to upload their photos. Another way to do this is to create a contest. Ask fans to upload their best photos relating to (whatever the nature of your business is). Tell then you’ll choose a winner and give out a prize. And hey presto, you’ve got your fans tagging your page in their photos and giving you free advertising to their friends. Continuing on from the previous point, one of the best ways to get people to tag your page in their images is to run a fun contest. Create a prize that you can giveaway. Obviously this will vary dramatically depending on your budget, but you can run a great contest for free. I personally created some fun contest by giving away ebooks. The rules of these contests are simple: for every picture that someone tags your page name in, they get 1 entry into the prize draw. This motivates people to tag your name in lots of different pictures, leading to some excellent free promotions for your page. This is one of the quickest ways to get Facebook page likes. 15) Get Facebook followers from your blog by linking your comments section of your blog with Facebook. Some blogs are excellent for generating likes and shares. Other blogs are better at creating conversations and making people leave a comment. To make the most of your comments make sure they are compatible with Facebook. The WordPress Facebook SEO comments plugin is one good way to achieve this. Your comment system should include functionality to share comments on Facebook. That way whenever a user comments on your post your post appears on their profile. In my experience this is probably the easiest way to get Facebook page likes quickly. 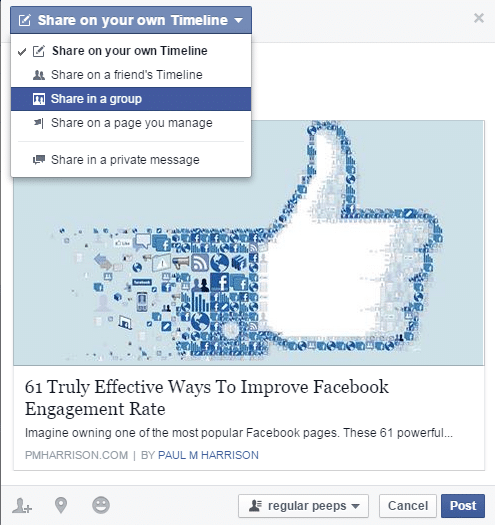 Simply share your page with different groups. Some groups have over a million members. If your page is relevant to that group you can very quickly earn a heap of page likes. But a word of warning. Most people don’t like it when the only thing they see from you is a request that they like your page. To avoid this, ingratiate yourself with the group first. Get involved in some of their discussions. Make sure they know you at least a little. Then ask them to like your page. 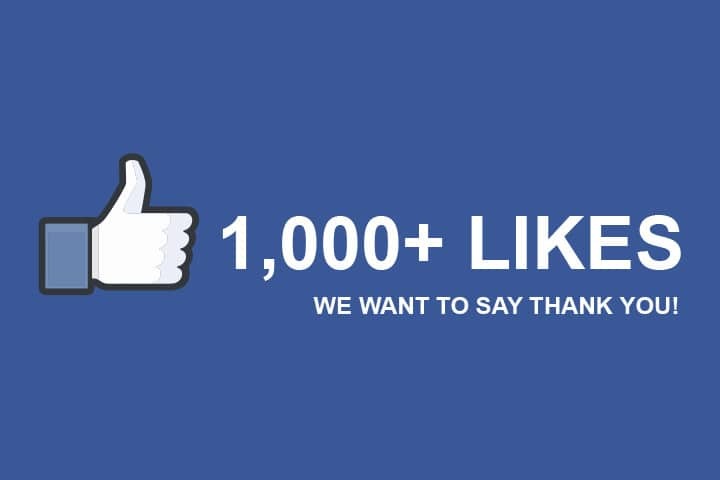 You’ll receive a lot more Facebook page likes this way. If your page pertains to a local business you should promote it in real life. For instance if you’re running a local store all of your customers are going to be local. The only people who matter to your Facebook page are those local people who will actually visit your store. By putting your Facebook URL on your promotional products and in physical locations you can target your local audience. They will then share your posts with their friends, many of whom will also be local. This can quite quickly lead your store to being popular with your local community. Really the only way to gain Facebook page likes is to engage with your audience where they already are. They’re already engaging with other Facebook pages. So if you want to reach out to that audience, logically you too should be engaging with the pages they’re engaging with. 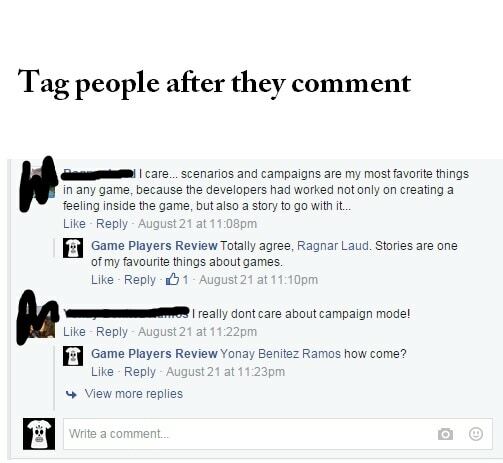 For my gaming blog I frequently comment on other pages likes Polygon, IGN, and Kotaku. This puts my profile in front of their audience. That audience is then just one click away from liking my page. If your Facebook page is for a small business then I’m guessing you have quite a lot of different promotional materials: business cards, calendars, and the other usual products. Be sure to put your Facebook business page URL on all those products. To make this more effective you can also hand out your promotional materials to your friends. If you’ve got a calendar give one to all your friends Hopefully they’ll hang it up somewhere other people will see it. This is an old-school marketing technique that still holds water today. 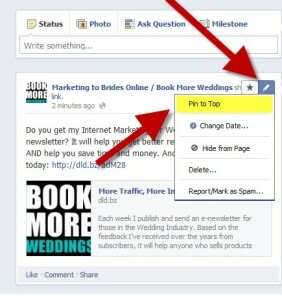 This is a great way to get customers to like your Facebook page. Are you an active emailer? If so you might as well go ahead and put your Facebook page URL in your email signature. 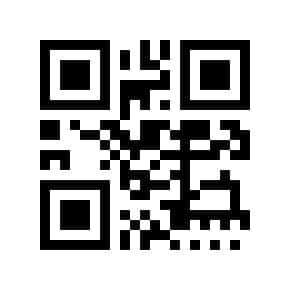 A QR code is a barcode you can scan on your phone that will direct users to your Facebook page. You can create one using a free service like QRStuff. The best type of content for getting new Facebook page likes is video content. Videos are the most popular type of content online. Not only do they generate more post engagements– leading to a good Edgerank–but they also increase the amount of time people are engaged with your page for. But there’s another benefit to video that other media formats cannot match. Video gives you the ability to genuinely put yourself in front of your audience. When people genuinely see the person behind the page (that being you) they form a much stronger relationship to that page and are much more inclined to engage with the page and to recommend it to their friends. This is a direct extension of the above. If you’re going to be producing video anyway you may as well put those videos on Youtube. The second biggest search engine in the world, Youtube holds unparalleled power and can dramatically improve your marketing efforts, leading to thousands of Facebook page likes in next to no time. Your Facebook URL is an important part of your social media marketing campaign. You’re going to be referring to that URL often in order to direct people to your page. For that reason it’s important your URL be memorable so that anyone you give it to remembers it. The URL should naturally reflect your page and generally speaking the shorter the URL the better. 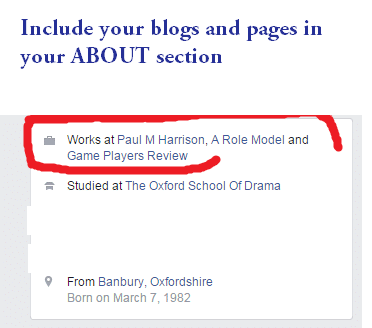 Unfortunately, I happen to have one of the most common names in the world, “Paul Harrison”, so finding a short URL for this page is a challenge! Got any idea? Let me know in a comment below. 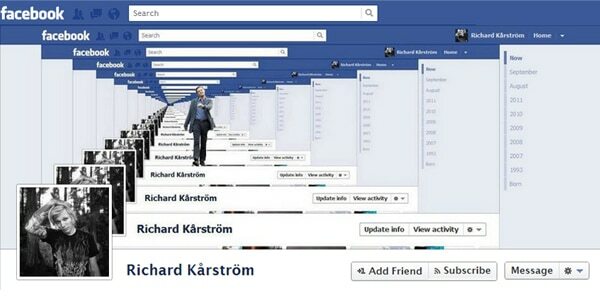 The better you make your Facebook timeline look the more Facebook page likes you’re going to get. But this is a hugely subjective thing. The question you have to ask is How do I make my Facebook timeline look pleasing to my demographic? Different demographics enjoy different kinds of timelines. Business people will generally enjoy clean and well organised timeliness that present facts and figures. Foodies want lots of pictures of sumptuous food. Gamers like fun and a little craziness. Research your demographic and discover what design styles have worked for other pages. Then use your research to create the perfect page for your demographic. Create your timelines as you would create a product. A product has a market and it has a purpose. Everything the product then does is about meeting its purpose and pleasing its market. Who is your market and what is your purpose? Decide those things and then stick to them. For instance, I run a page about meditation My primary demographic for that page is 30 – 50 year old women who are into health and who want to relax and enjoy life. So the more images and updates I put up about 30-50 year old women relaxing and enjoying life, the more effective my timeline will be. Your demographic will also have specific styles they enjoy. For instance a younger demographic might like memes where an older demographic might like beautiful photos of natural scenes. Find out what works for your demographic. Once you know what works for them, make sure your Facebook timeline reflects those needs, interests, and preferred styles. One really easy way to do this is to simply go to Facebook Insights, find your most popular posts and put them at the top of your timeline. To get more like on your Facebook page, make it a product all in itself. 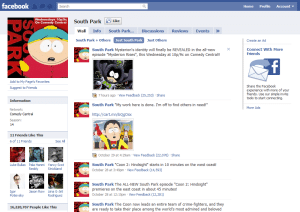 The south Park page is a continuation of the brand but it’s also its own entity. Hopefully people will be seeing your images often. When people visit your blog one of the first things they’ll notice is your images. When other people share your posts, their friends will see your images. And when someone else rips off your images, their audience will also see your images. Long story short people are going to see your images. That makes them an ideal place to marke your Facebook page. Simply stick your page URL on your images via a watermark. You can do this yourself in Photoshop. 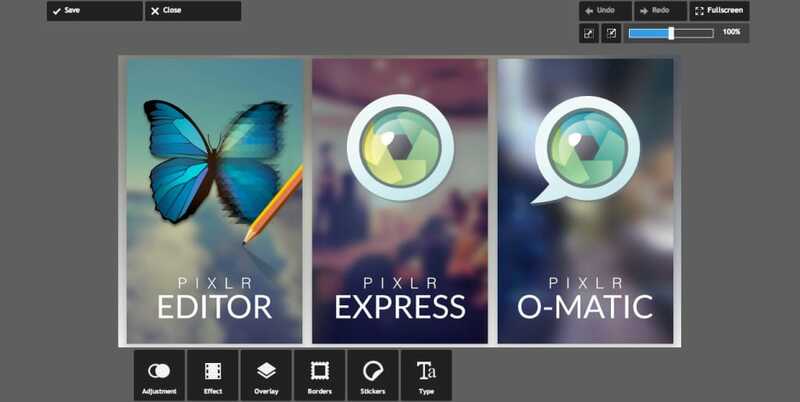 If you’re using WordPress you can use the plugin Image Watermark, or you can use an online system like Pixlr. You can do the same thing with your videos and put a watermark on them using Adobe Premiere Pro or another video editing suite. People who share your blog posts will probably like your page too. The only problem is that people tend to forget to do things online because we’re on a dopamine-injected searching and sharing spree. Don’t let them forget. 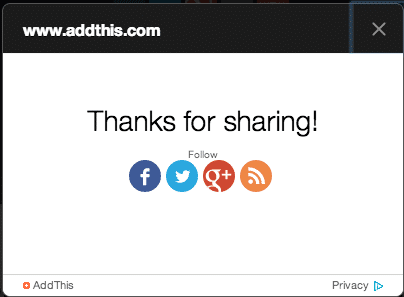 If you’re nifty add code you can create your own function to load a “Like My Page” popup when someone hits a share button. Otherwise just use AddThis. The free version of their tools comes with a function to do precisely this. Addthis and other social media services allow you to thank your audience for sharing your posts and to then ask them to like your Facebook page. How long has your page been going? If the answer is anything above a month and you have more than 1000 page likes then you should visit the Insights Tab. Go to Your Page > Insights > Posts > See all posts and take a look at which of your posts have been performing the best. Diagnose your popular posts. Determine what made them successful. Then use that information to create better posts. This will help to improve your engagement rate, which will in turn improve your Edgerank, and that will finally lead to more Facebook page likes. We might have all these fancy Facebookses and Twitters and a bunch of other sites and programs that would make an old man pine for a return to the days of bootlegged alcohol and newspaper boys, but we’ve also got the oldest marketing tool in the book: Word of mouth. Get your lips flapping. Talk to your friends, family, colleagues, and even strangers about your Facebook pages. Most people like to connect to pages that they know the owner of. Make use of that. Your friends and acquaintances are the easiest likes you can get. Use them. You’ve got a blog and that blog has a Facebook page plugin widget stuck in the sidebar, right? Odds are most people ignore it because it’s just haphazardly tacked on to your site. You’re not directing those eyeballs towards the LIKE button. 3) direct that attention towards the LIKE button. Obviously the easiest way you can do this is to have a massive “FOLLOW ME ON FACEBOOK” banner at the top and bottom of your page. But a lot of people will ignore that too. I find that one of the best ways to direct people to your Facebook page is the age old hyperlink. Think about it. You’re reading this right now, right? Your eyeballs are on this very sentence right now. So what could possibly be more effective than me saying, “Hey you, yeah you, take two seconds right now to click this link and LIKE my Facebook page”. It just can’t get any more direct than that. One thing that always amazes me is how little we’ve changed since we were kids. If you’ve got kids you’ll know that you want to reward them for their positive behaviour. If they complete their homework you let them play Grand Theft Auto V for an hour because that way they’ll associate homework with rewards and they’ll do their homework again tomorrow. Exact same thing with adults. When you reward someone for their actions you motivate them to repeat those actions in the future. That’s why you should reward people who like, share, and comment on your posts. Because then they’ll be more inclined to do it again. Simple. Find forums in your niche, get active on them, and put your Facebook URL in your signature so everyone will see it and visit your page. One of the most popular items to sell online is a t-shirt. Websites like TeeSpring and TeeFury make millions by selling t-shirts. Okay, they’re t-shirts that have quite blatantly ripped off the copyright of some major movie studio and game developers, and millions may question the ethics of such an operation, but they make cold hard cash in spades. People love t-shirts. 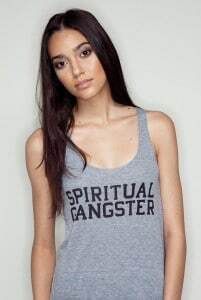 If you create a high quality logo and a slogan for your blog / product, then put it on a t-shirt and sell it. Not only will you nab some cash but you’ll also get free publicity anytime someone wears that t-shirt out in public. And if you are a blog owner let’s face it, you’re more like to make cash through selling tee-shirts than through Adsense, right? Friends. You need them and so does your Facebook page. You know, one of the main reasons why people like a Facebook page is because they feel some sort of connection or affinity for the page owner. What better way to create that connection than by first becoming friends? Make friends with as many people in your industry / niche as possible. Then suggest your Facebook page to them. Not only will you get more likes for your Facebook page but you’ll also make valuable connections. Provided you’re a popular and interesting person your Facebook friends will visit your profile every so often. Cash in on those visits by advertising your Facebook page in your cover space. You could use the exact same cover photo that you have on your profile, or you could use a different image. Either way, just make sure it targets the right demographic and that it includes your Facebook page URL. Also tag your Facebook page in your cover’s description. Give away free stuff and put the news of the giveaway at the top of your timeline. That way when people see your page they’ll think “I wish I’d liked this page sooner so I could have won”. Then they’ll naturally click that LIKE button without a second thought. You don’t have to give away anything too costly. If you’re running a small business you probably have a somewhat limited budget, in which case don’t go for big money items but something smaller but fun, like a custom tee or a signed book (the latter being the obvious choice for authors). People cannot help but click LIKE when they see an absolutely stunning photo. The problem is that people are getting used to seeing more and more high quality images in their feeds as pages compete with one another. If you want the best photos you’re going to have to either make them yourself or be highly skilled at acquiring images. The ones you find in Google search usually aren’t good enough. Most of them look stock-like, and people have an adversity to stock images. “Stunning” is also a highly subjective term. Your photos don’t have to show beautiful people in amazing places. They can be cute little cartoon sketches. There just has to be something about them that really makes them stand out. Deviantart is a good place to find images. Just ask the creator if you can use their image in exchange for mentioning their name. Most will agree. This Ryu / Sagat art is awesome to me. But your taste may vary. Use images that your demographcis will find amazing. You might not like the idea of using Facebook ads to gain exposure. But think about the amount of time you’re investing into your social media marketing. It can be easier and a lot quicker to simply take one of your most successful posts and to use Facebook’s advertising service. Just like when you’re building backlinks, the more friends you have the easier it is. Making friends with the owner of a successful blog is a real power card. Reach out to them and just be cool. Obviously you’ll click anyway cause you’ve got at least one major interest in common. And once you’re buddies they’ll be happy to help promote your page. Find out who owns the most successful pages in your niche. Add those people on Facebook. Get to know them. Make friends with them. 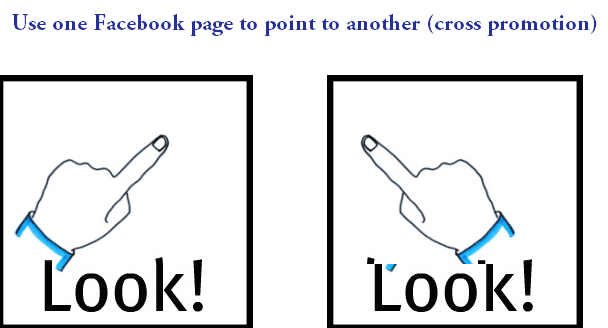 Then, a little way down the line, subtly suggest your page to them. They might do you a favour or they might not. If they do you could very quickly earn thousands of likes. By filling out all your page info you can help your page to be discovered in search engines. But search engine optimisation is not as important as audience optimisation. Make sure that all the info that you put on your Facebook page speaks to your audience. It should talk in their language. It should tell them why they should like your page (directly or indirectly). And it should make it clear what your page is all about. Having a good Facebook engagement rate will give you a high quality Edgerank, and that will lead to your page showing higher in people’s feeds. For a detailed guide on how to achieve this, read my list of 61 ways to achieve a high engagement rate. Once you’ve captured a good chunk of your primary audience you’ll want to expand into related areas. For instance, let’s say you started a page about getting likes on Facebook. Expand it to incorporate other aspects of Facebook, then other social media networks, then social media marketing in general, then marketing in general. By gradually expanding outwards you can draw in a new audience. This will lead your page to continually grow over time. This is also great for SEO as you’re discussing related topics that share the same keywords and that Google will consider to be related (meaning they’ll rank you favourably for those related topics). Shares are where the real value is at. A like is a dead-end thing. A share is a way to bring in new followers. One person has liked your page. They share one post that brings in two people. They all share on post and your number of likes doubles. This can soon lead to hundreds of thousands, if not millions of likes. But just how do you get a like as opposed to a share? I’ll be writing a comprehensive guide to that subject soon. Like me on Facebook for updates so I can let you know when that article comes out. A mistake that a lot of page owners make is that they talk about any subject they like regardless of whether that subject is popular right now or whether anyone is actually talking about it. Of course you can discuss anything you like on your page. But if you actually want to get people interacting with your page you need to meet them halfway and involve yourself with the conversations they are already having. Start to discuss trending topics. When you talk about trending topics your posts will reach more people. Once you’ve got those eyeballs on your posts, try to steer people towards whatever you’re selling. For instance let’s say you’re selling a video game. Another video game is trending right now. To get seen by your audience you need to discuss those trending games. But of course you want to steer people towards your game. So what do you do? Try something like “I love the open world of GTA5. It reminds me of the open world of [your game]”. Talk about trending topics and then steer those topics towards your page. This is an excellent way that you can quickly increase Facebook page likes. Any smart businessman knows that one of the best tools in your arsenal is a competitive analysis. Facebook makes it easy for you to see which of your competitor’s posts are performing well. Visit Your page > Insights > Pages To Watch > See More Pages > Click on a page. This will show you your competitors recent posts and how they are performing. You can use that information to help decide what to post next. This one can seem a little weird. Because it’s not like you’d go and meet a stranger in real life and say “Hey, like me”. But it can work online. And who knows maybe if you actually asked a stranger to like you it might work…. hmmm… I’m going to try that just for interest’s sake. Anyway, ask people to like your Facebook page. You can be straight up and honest and say “I’m trying to grow my blog. Would you mind helping out by hitting liking my Facebook page?” You could give them a beneficial reason “Like us for authoritative news are garden gnomes” or you could enter everyone who likes your page into a prize draw. But ask them to like you. Most people follow the trends and post whatever is in vogue. 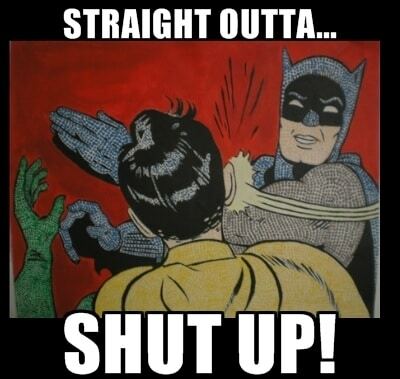 For instance, the meme that starts “Straight outta…” (the Comptom meme) was in vogue recently. Everyone created their own meme for it. Page owners followed suit. But guess what? Most of the page owners were too late. 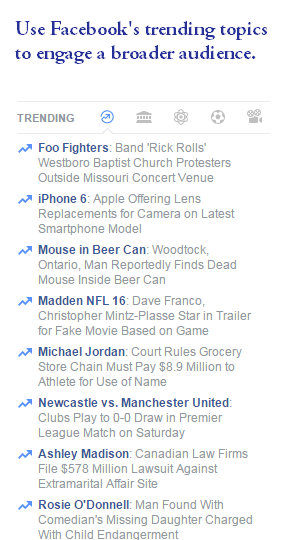 Trending stories and news don’t stay trending very long. If you see a new type of meme, create our own version, and then post it, by the time you’ve posted it everyone in the world is already bored of the meme. Memes and trending stories don’t last long. That’s one reason why it can be better (albeit harder) to create your own stories and your own types of memes and viral posts rather than just copying everyone. This is a neat little trick that I’ve been experimenting with lately. Basically you select one of your fans to win something – whatever you have to give away. You then go to your blog and create a post saying “For X and their friends”. Then message the individual and tell them that they were selected at random to win, and that they can share their winning item with whoever they like. For example, I have ebooks to giveaway. So I choose one of my fans to give that book away too. I then tell them that they can use the share buttons to also give their friends a copy of the book. 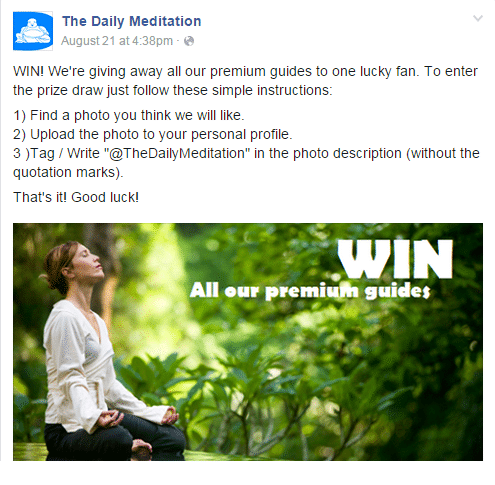 If your prize is worth winning then your fan will share the page (and thereby the page) with their friends. This brings their friends to your site, makes them like you (both literally and, hopefully, in terms of Facebook like), gives your blog publicity and also promotes your product. Only do this with a digital product that you can reproduce for free. Otherwise you’ll end up having to pay for a thousand physical copies to be made and shipped to your fans. I’m confident you already know about this so let’s just carry on. Facebook offers an official recommendations bar that shows visitor alternative content. There’s a like button on the recommendations bar so it can be a good way to get some more Facebook page likes. But I personally find alternative services like Addthis to be better. If you’re using a self hosted WordPress site you can add a plugin that will bring up a scroll bar on load. You can also use a popup box that will show your Facebook fan page after a certain amount of time has passed. Some popups can also be triggered on exit-intent, meaning they’ll load when your visitors are about to leave your site. That can be a fantastic conversion method. 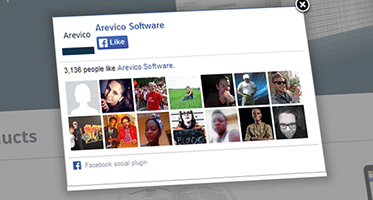 I personally use the Arevico Facebook popup which works nicely. It shows a Facebook Page Like Box after a certain amount of time. Do you collect people’s emails? If not I highly recommend it. Many marketing specialists believe that emails are still the most important way to get people to sign up to your site. If you have been collecting emails then you can engage in some cross promotion and use emails to market your Facebook page. Simply ask the people who subscribe to your email to also like your Facebook page (you might want to mention that there’s exclusive content on Facebook so that they feel they need to have both the email subscription and the page like). I recommend reading Search Engine Journal’s article on the importance of collecting emails. If you run a store or another service with a physical address, make sure to ask your customers to like your Facebook page. You can be clever about this and put your Facebook page URL on your shopping bags and on the front of the till, and any other place where it’s likely to be seen. 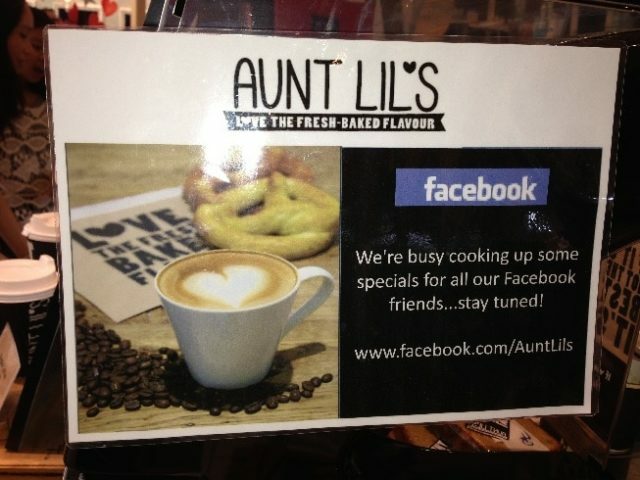 Aunt Lil’s coffee shop is just one of the many physical locationcs using in-store Facebook promotion. You yourself are your biggest marketing asset. Make use of your everyday life. 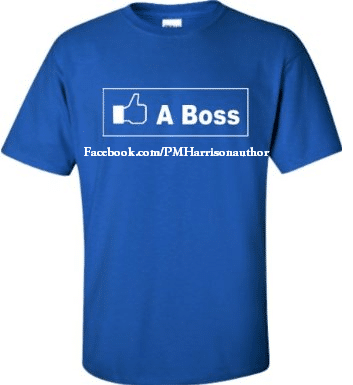 Print out a t-shirt with your logo and Facebook URL and wear it around. 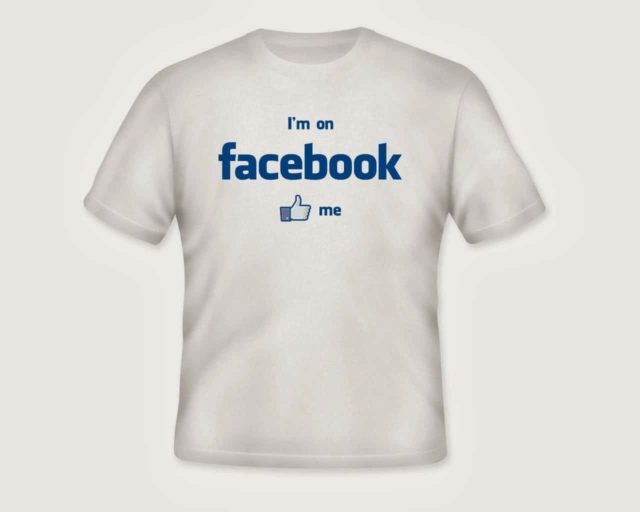 You’ll be amazed quite how many people end up looking at your t-shirt and then liking your page. Not only are t-shirts great items to sell. They also give you free promotion. Guest posting used to be one of the main ways to gain backlinks for SEO purposes. That strategy has recently come under fire and many SEO specialists believe that writing articles for other sites just for a backlink is an ineffective use of time. There is, however, another reason to guest post: social media. Major blogs and sites are seen by millions of people a month. If you can get those visitors to read your article, and then convert them into Facebook fans, your page will become popular fast. I recommend reading GoinsWriter’s article on how to use guest posting to expanding your audience. 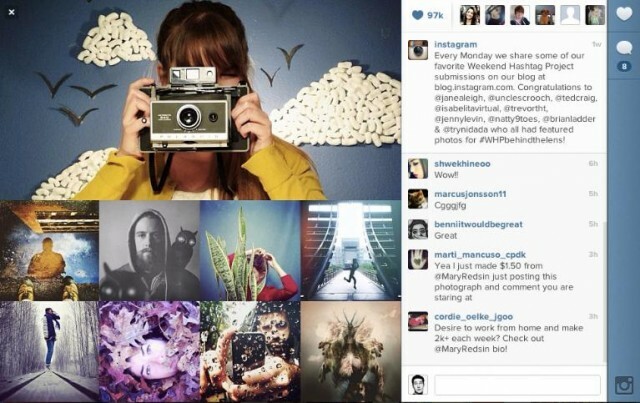 Marketers cannot afford to overlook Instagram. Instagram is one of the largest social networks in the world. Plus it offers an easy way for you to update your Facebook, Twitter and Google Plus profiles all from one place. Be sure to put your Facebook page URL in the profile. 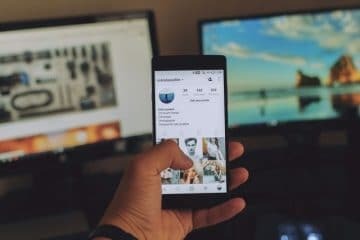 Use Instagram and connect your profile to your Facebook page. A podcast is an excellent way to reach a new audience, not only on the web but also on iTunes. One of the best things about a podcast is that it allows you to express your personality in a different way. The more personality you give your blog / product / page the closer your audience will feel to you and the more they’ll buy into your products. Try using Soundcloud for a service that you can easily integrate into your blog and into Facebook. Remember to include a call to action so you actually take advantage of your new audience. Youtube allows you to use backlinks to connect to your site or to your page. But the problem is that you have to be able to prove that you own the site in question. You can get around this by using a redirect. A better alternative is to use a free service like LinkTube, which makes it easy to link out to your Facebook page. 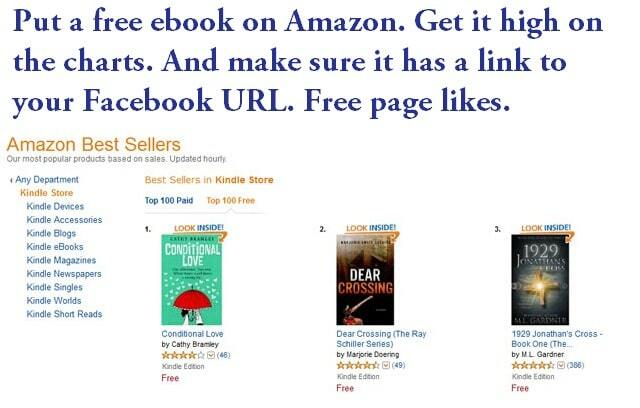 There are a lot of benefits to giving away a free ebook. For starters having a book out about a subject will give the impression that you’re a real expert. Secondly, you can include a link in your book to your social media profiles. I personally like to put a big image link on the second page of my ebooks and get people to sign up, telling them it’s part of the experience. Put your ebook on Amazon and sell it for free. This will quickly attract a lot of people, many of whom will like your Facebook page. Also, if you put out one free ebook you’ll find it’s easier to sell other books. You’ve given readers a freebie through which they can get to know and trust you. Visit highly popular blogs that have a comments section that lets you use your Facebook page. Say something entertaining or informative so you get lots of likes and end up at the top of the comments. Then when other people visit that blog and read your comments they can click your profile and visit and like your page. Infographics are the one of the most common sources of viral content. They simply make your article / information a lot more pleasing to look at and that leads to more likes and more shares. 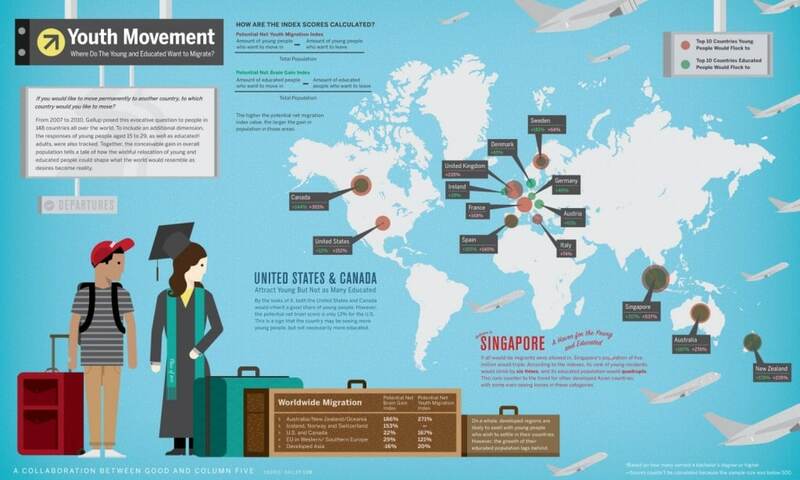 Honestly you don’t need to be a design wizard to create a great infographic. Just head into Photoshop, set up some basic images, add some text and hey presto you’ve got yourself an infographic. It can be as simple as a ten minute job. Once you’ve got your infographic sorted be sure to add it infographic directories. One of the best services for infographics is visual.ly. Fun and informative infographics are one of the most viral types of content. The most valuable contacts you’re ever going to get are the people you meet in real life. Those are the people who genuinely get to know you and because of that they’re also the people who will help you out the most. Attend networking events in your area so you can get to meet fellow bloggers and social media marketers. The more people you meet in real life the more people you have access to online. When you give out your business card you want to make it as simple as possible to make people access your Facebook page. One of the easiest ways to do that is with a QR code. Creating a QR code is easy and free at sites like Kaywa and QRStuff. 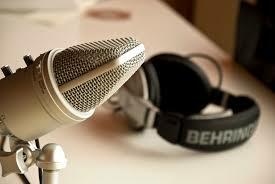 Radio interviews are a fantastic way to gain exposure for your blog. But you might wonder how you’re going to attract the attention of a reputable radio station. There are two key ways. 1) Make friends with someone who runs a radio show. 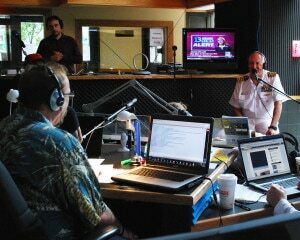 2) Create an event that is worthy of the radio station’s attention. One of the best ways to do this is to run a charity event. Let’s say you producer running shoes. Put on a race for a charity that is in the public’s eye right now. Then approach the radio station. If they think your event works with their shoe they’ll try to slot you in. 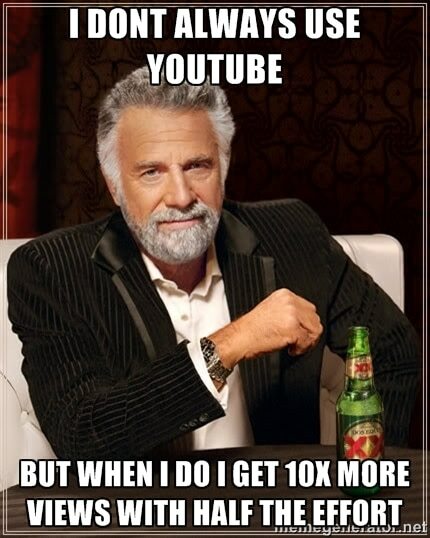 You then gain a lot of exposure for free. 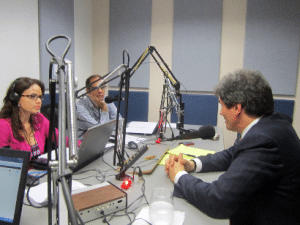 A radio interview is a fantastic way to reach a new audience. I recommend reading Radio Guest List’s guide to securing a radio interview. Easy. Make sure to make the most of your Twitter followers by advertising your Facebook URL to them. You need to take this with a grain of salt. If you’re overly active about self promotion your followers will abandon you. You need some reason to make your Twitter followers visit your Facebook page. You could just ask them to add their opinion to a conversation you’re having on Facebook, or mention that you’re running a special event for which you’ve set up a Facebook page. Create a reason to make Twitter followers go to your Facebook page. 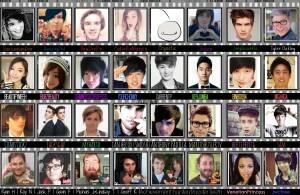 There are lots of Twitter tools that you can use to create a custom background. Your background is one area of Twitter that you have complete control over. It’s also a very large chunk of virtual real estate. Make use of it. Put your Facebook URL in your Twitter custom background. Twitter is excellent at generating huge conversations about trending events. Make use of that. 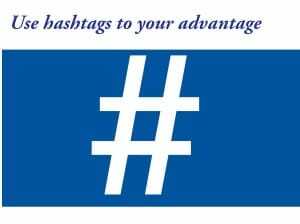 Tweet using trending hashtags and find some way to turn that hashtag into an excuse for people to visit your Facebook page. People need to get to know your brand. The only way they’ll ever do that is through repeated exposure. So post frequently and create a relationship with your audience. Odds are your Facebook page treads between different demographics to a certain degree. 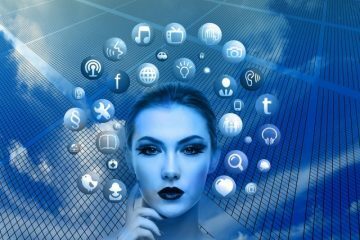 For instance on this blog I write about both social media marketing and writing, which target slightly different demographics. That splits my audience and effective halves the number of likes I’ll get for any one post. If I share a post on SMM I’ll get likes from the SMM crowd, share a post on writing and I’ll get likes from the writing crowd. This all effects my Facebook engagement rate and my edgerank, which in turn effects the number of Facebook page likes I get. End all that by targeting your posts. 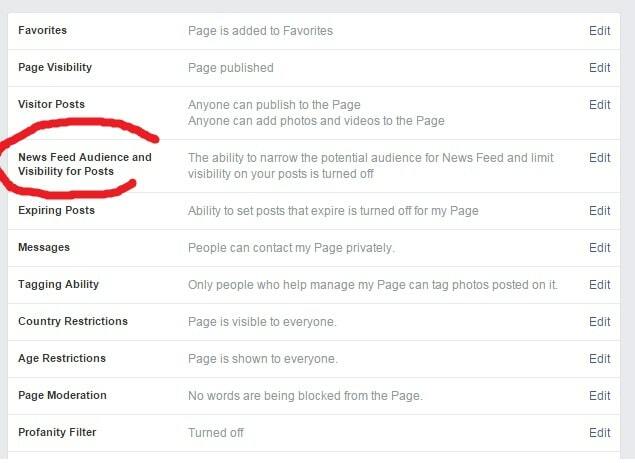 To set this up visit Your page > Settings > News Feed Audience And Visibility For Posts. Once you’ve set that up you can change the visibility when you publish a post. Use this to more precisely target the demographics within your fanbase. What percentage of people actually see your average Facebook post? 10%? 20% Chances are no one’s going to cry foul if you happen to post the same content twice. 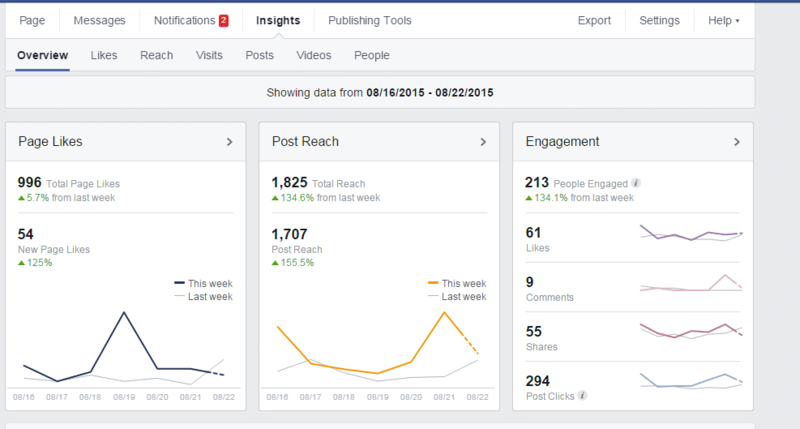 Visit your Facebook insights, find your best performing posts, and repost them. ClickToTweet has been gaining popularity over recent years. ClickToTweet allows you to create a link that will autofill the Tweet box with a message and your @ address. Just click on this Tweet button and you can see ClickToTweet for yourself. Okay so this one is obvious and you probably do it already. Use Twitter to promote your blog content. Then, once your Twitter followers are on your blog they’ll see your Facebook URL and plugins and will hopefully like your Facebook page. When you like someone else’s page let them know about it. Either tag them in a status update or in a Tweet. Most people will share the love and like you back. When someone likes your page thank them. This shows that you care about them, which helps build the relationship and motivates them to continue to engage with your page. Also they may well be inclined to then mention your page to their friends. People flipping love quotes. They cannot get enough of them. Find a picture that represents your audience, put a nice quote over the top of it and bingo, you’ve just got the easiest likes and shares you’ll ever get. Photos get 104% more comments, 53% more likes, and 84% more click-throughs. Psychologically, people like your page because it reflect who they are or who they want to be. Make your posts reflect your demographic and that demographic will come to you in droves. Positivity is the key. That’s true for self help and it’s true for social media marketing. People love positivity. They can’t get enough of it. Show that you and your brand are happy, positive, and cheerful and people will fall for you hook, like, and sinker. 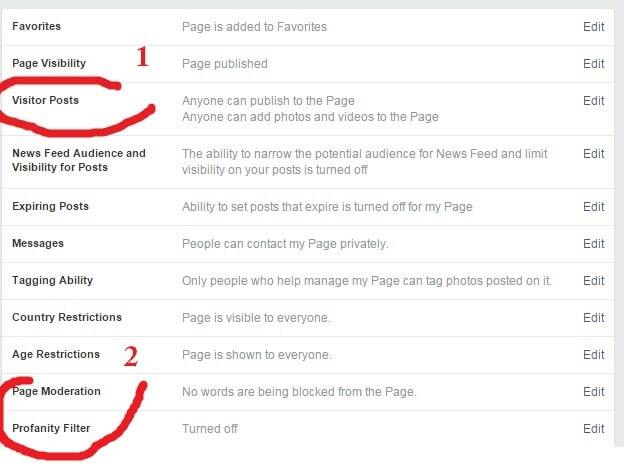 When people visit your Facebook page you want them to see the most popular (i.e the best) posts. Go through your Facebook insights. Find your most popular posts and pin them at the top of your page. If a post isn’t working it just isn’t working. There’s no sense in leaving unpopular posts on your timelines where visitors will see it. Go through your timeline, find low quality posts and either date them back (so they don’t show unless the user scrolls way down) or just delete them. Make friends with the owners of other Facebook pages. Then agree to share each other’s content. This is the equivalent of having twice the amount of power that your Facebook page has alone. Depending on the nature of your page you may or may not want other people to be able to post to your page. On the one hand, if people post to your page their friends see an update in their newsfeed, which can add virality. On the other hand, if you let anyone post to your page you never know what’s going to be posted or what effect it might have. So make your decision here wisely. Usually pages can’t tag personal profiles. But there is one exception to this. You can tag personal profiles after they’ve commented on one of your posts. So, aim to get as many people commenting as possible and then reply to everyone while tagging them. This will make the post show up in their friends’ news feeds, leading to increased exposure and some quick Facebook page likes. Some page owners aren’t particularly social and won’t get involved with your page. But others are highly social people who like being connected to other people in their industry. It’s the latter group that you want to target. Tag other pages in your posts and see if they reply. If they do reply you might have just found yourself an social media marketing partner. Plus, Hopefully they will return the favour and tag you back. It can be a challenge to find enough different topics to write about. One way to solve this problem and to please your audience at the same time, is to head back to your insights. Find your most popular posts. Now write those posts into a full article and publish on your blog. Share the blog post on your Facebook page. This gives you more blog content and also helps you to produce content that your audience enjoys. Asking your friends to simply click the LIKE button is one thing. That’s an easy way to get a few likes when your page is in its infancy. But a like is just a like. What you really want is active participation from your audience. To get the ball rolling ask your real life friends to actively participate in your page by leaving comments and sharing articles. You can also allow them to share their own content to your page. When you pin a new picture on Pinterest you can attach a URL. Go through your Facebook page and find all your most popular images. Share them on Pinterest and leave a link back to your Facebook page. When you like a post you show up in the list of names under the post. You can use this as free advertising space. Find posts that don’t have that many shares and like them so that people can actually see your page name (otherwise you’ll just be one of the thousands of names). This is also a good way to set up a positive relationship with other page owners. Some pages get millions of likes by doing absolutely nothing original and by not even being particularly clever. They do it by using the usual suspects. The usual suspects are animals, jokes, quotes, cute kids, and people doing stupid stuff. Use a combination of those things and thousands of people will like your posts. I actually hope Facebook cracks down on this somehow because thousands of pages have tons of likes simply because they went to Goolge Search or Youtube, nabbed an image or video, and uploaded it as their own. We’ll see what happens. 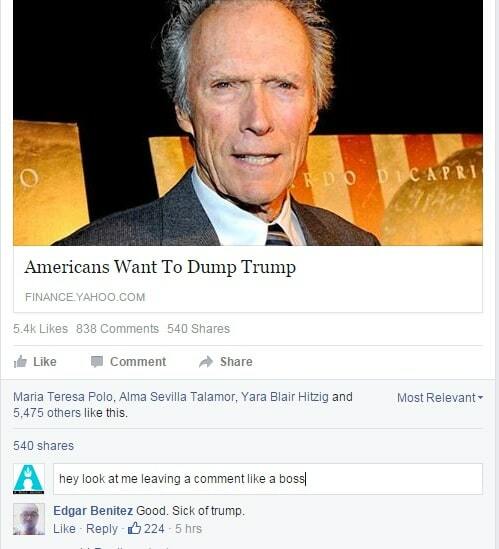 Edgerank is becoming more and more important on Facebook. If you want to succeed you need a good Edgerank, and to get a good Edgerank you need a high engagement rate. The problem is that different members of your audience like different things. To solve this problem, break your audience down into smaller groups. The right way to break your audience down will depend on the nature of your business. For instance if you’re running a lifestyle magazine you might find that some members of your audience are interested in entertainment, some food, some health, and so on. Use Facebook’s audience targeting system to target those people based on their interests. Then you can give each member of your audience precisely what they want. 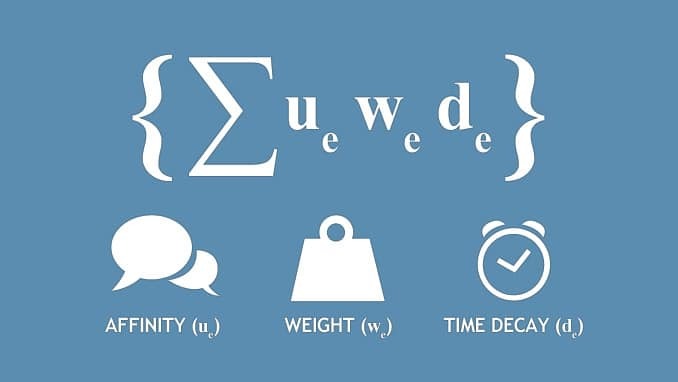 An extremely implified version of Facebook’s Edgerank equation. Brevity is the soul of wit and also the soul of social media. People simply don’t want to spend a long time looking at your posts. The more analytics you do the more you’re going to understand what generates likes. By continually researching your own content and the content of your competitors you can determine what to post and when and you can make more informed decisions when dealing with your audience. and 2) Put it front of every pair of eyeballs you can find. You need to spread like wildfire. And to a degree it doesn’t matter how you get in front of people’s eyes, you just have to get there. You could tattoo your body with your Facebook URL then run naked onto Wembley Stadium. You’d probably get the press covering you and your URL would go extremely viral. So while I’ve spend literally hours writing this list, at the same time I can all be expressed by the very simple code: Likability + Viewability = Likes. Have a good brand. Put it in front of people’s eyes. Done. You can use Facebook apps for virtually any purpose you can think of. You can pull your blog posts into Facebook using an app. You can run contests. You can host giveaways. You can use an app to integrate your Twitter and Instagram profiles into your Facebook page… the possibilities are endless. Get to know Facebook apps and see how you might use them for your own page. If, like me, you write for high profile magazines, you might look into ways to use those mags and your writing assignments to generate Facebook likes. Ask editors if they can give you a byline including your Facebook URL. Many will say no. Some will say yes. People take note when you go against the crowd. And people naturally like you when you’re positive. Try finding something that most people look at negatively and write about it positively. For instance, try writing a post about how surviving cancer makes people stronger than they were previously. This type of post generates likes and shares very effectively. The easy way to get Facebook page likes is to create hundreds of pages full of quotes, images, and viral content (most people scrape these). Then just put your Facebook like button below every image and every quote. Easy. What other ideas do you have for ways to create Facebook likes? Let’s discuss this in the comments and on Facebook / Twitter. Together maybe we can make this the definitive list on this subject.